The New York Times bestselling author of The Tiger’s Wife returns with a stunning tale of perseverance—an epic journey across an unforgettable landscape of magic and myth. In the lawless, drought-ridden lands of the Arizona Territory in 1893, two extraordinary lives collide. Nora is an unflinching frontierswoman awaiting the return of the men in her life—her husband, who has gone in search of water for the parched household, and her elder sons, who have vanished after an explosive argument. Nora is biding her time with her youngest son, who is convinced that a mysterious beast is stalking the land around their home. Lurie is a former outlaw and a man haunted by ghosts. He sees lost souls who want something from him, and he finds reprieve from their longing in an unexpected relationship that inspires a momentous expedition across the West. The way in which Nora’s and Lurie’s stories intertwine is the surprise and suspense of this brilliant novel. Mythical, lyrical, and sweeping in scope, Inland is grounded in true but little-known history. 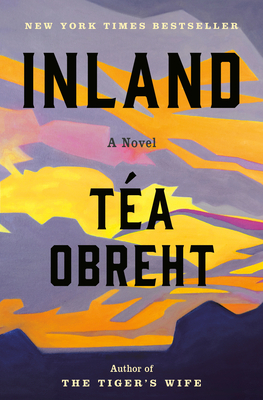 It showcases all of Téa Obreht’s talents as a writer, as she subverts and reimagines the myths of the American West, making them entirely—and unforgettably—her own. Téa Obreht is the author of The Tiger’s Wife, a finalist for the National Book Award. She was born in Belgrade, in the former Yugoslavia, in 1985 and has lived in the United States since the age of twelve. She currently lives in New York City and teaches at Hunter College.